You know it’s important to visit A Plus Dental for your semi-annual checkup, but do you know why it is important? You probably know that we check and clean your teeth, but do you know the ‘hidden’ truth about your checkup? The truth is that your A Plus Dental dentist and our team do a lot more than just clean your teeth. In fact, our checkup is designed to check your oral health, oral hygiene habits, your overall health, and if you seem to be suffering from, or likely to be suffering from, a variety of conditions. Smell your breath. Bad breath (halitosis) can be a symptom of dental problems, but it can also be a symptom of far more serious general health issues. Persistent bad breath can be a warning sign of gum disease, dental appliances that don’t fit, cavities, or a mouth infection. General problems indicated by bad breath include diabetes (sweet smelling breath), respiratory infections (bronchitis or pneumonia), acid reflux (stomach acid flowing back up the food pipe), sinus infections, or kidney or liver problems. Check for Osteoporosis. Osteoporosis is a bone disease that occurs if the body makes too little bone, loses too much bone, or both. Bones become weak and may break from a fall or, in serious cases, from minor bumps or sneezing. Osteoporosis affects people of all different ages and backgrounds although it most common in post-menopausal women and the elderly. How do we spot it? Osteoporosis causes changes in the bone supporting the teeth, which can manifest as a receding gum line and loose teeth. Assess for dry mouth. Dry mouth is a lack of saliva, which is a problem because saliva helps wash away debris and bacteria that lead to cavities and gum disease. If you’re producing too little saliva, we will spot it and try to help you discover its cause. It may be caused by medications, or it may be a sign of a disease such as Parkinson’s disease or diabetes. If it’s nothing serious, we may suggest slight lifestyle changes, suggest a changed medication, or even provide artificial saliva. Examine your tongue. A healthy tongue is pink and covered within nodules. Most causes of tongue problems such as soreness and discolouration are not serious, but in some cases, a painful tongue may indicate vitamin deficiencies, oral cancer, AIDS, and other serious illnesses. Check for cancer. Early signs of cancer in and near the mouth are easily missed. So at every routine checkup, your A Plus Dental dentist looks for symptoms of mouth or throat cancer, such as white lesions, blocked salivary glands, sores or ulcers in the mouth that don’t heal, cysts, unexplained bleeding, discoloured patches on the gums and tongue, inflamed lymph nodes or neck glands. Sharp teeth, fillings, or incorrectly used/installed dental appliances, if not addressed, can cause chronic ulcers due to continuous friction and, in turn, lead to cancer. Assess your at-home oral hygiene habits. By looking at your tongue, teeth, gums, and surrounding areas, A Plus Dental staff can get a good idea of what is working and what needs upgrading in your at-home oral hygiene program. For instance, signs of tartar build-up between the teeth it may be a sign that your daily flossing is not as effective as it should be. 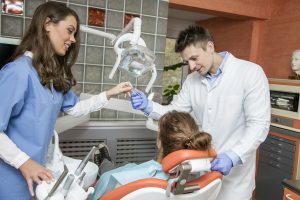 Our caring staff will ask you questions about your oral hygiene habits and suggest new techniques and tools to make your oral hygiene habits more effective. Check for Diabetes. Gum infection is often one of the symptoms of diabetes. People with Type 1 and Type 2 Diabetes are more prone to gum problems because they have a weakened ability to fight bacterial infections. During the course of a checkup, your dentist will be looking for typical signs of diabetes such as gum swelling, bone loss, and abscesses in the gum. If symptoms of diabetes are present, we will refer you to your doctor for additional tests. It is recommended that diabetic patients have more frequent dental checkups and dental cleanups. So you see, coming into your bi-annual checkup at A Plus Dental is not just an investment in your dental health and a big, sunny smile – it is also an investment in our overall all health and healthy lifestyle. Give us a call, today! It All Adds Up at A Plus Dental! A Plus Dental believes in honesty, trust, individuality, compassion and comfort. Our goal is to give our Campbelltown area patients, from infants to seniors, caring, relaxing treatments in a comfortable environment. When you choose A Plus Dental, you take the next step towards a beautiful, healthy smile with teeth that feel great in your mouth!! We have over 30 years of combined experience and treat each of our patients with the utmost care and respect. 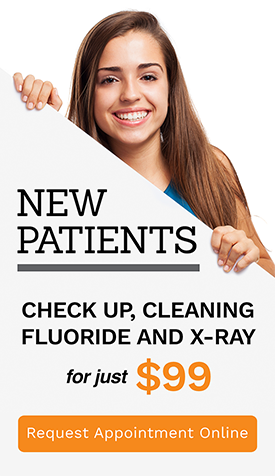 If you’re a new patient, enjoy our New Patient Dental Package check-up, clean, fluoride and X-rays for just $99! Book your appointment with us today and save $167! Eliminate Bad Breath And Boost Self-Confidence!